Muay Thai, or Thai Boxing as it’s more commonly known, is the national sport of Thailand and has been in practice and taught for around 2000 years. In ancient times, the people of Thailand developed Muay Thai as a defence against enemy nations and it was tested in hand to hand combat by the ancient warriors of Siam. It’s effectiveness is unmatched in the world of martial arts due to its simple training approach of utilising basic yet effective techniques. The class is available in Birmingham Academy. Known as the “Science of Eight Limbs” it is one of the oldest combat systems ever devised. Practitioners develop defensive and offensive skills utilising a wide variety of punches, kicks, knees and elbows executed with deadly accuracy and explosive power. It is for these reasons among others, that many now see Thai-Boxing as the most practical and effective form of self-defence. Since the 1920’s Muay Thai has developed into a modern day sport similar to western boxing and similarly has a global fight circuit. 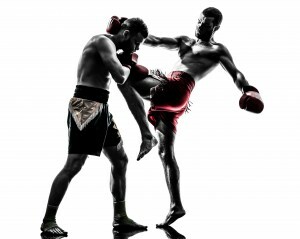 Thai-Boxing has also adopted a western grading system which assesses students on their individual skills and abilities to perform techniques effectively. Thai Boxing has now been adapted to cater for today’s modern day society, it is used on both a recreational and competitive level. Muay Thai fighters test their skills in the ring, but not all practitioners fight. Techniques taught are learned quickly and are easily integrated into daily life. Muay Thai has evolved to work well with a modern lifestyle. Students of all age ranges and abilities participate in the sport as it is an excellent form of stress relief, cardioid-vascular (fitness training), self-defence and it is extremely fun. We also provide MMA / Mixed Martial Arts classes in our Birmingham Academy. Come and Join us for a FREE lesson today.